If the Spectrum was the must have for the 8-bit era, then the Amiga was it’s 16-bit era alternative, at least until the rise of the consoles in the early 1990’s. PC’s were not yet fully functioning games machines and they cost a fortune. You could have gone for an Atari ST, but for some reason that machine never really stayed in the imagination of gamers once the power of the Amiga took over. I remember people at school having ST’s and I was the only one with an Amiga. Within 18 months that had changed and there was barely an ST owner out there. The Amiga could boast having superior sound and fabulous looking visuals. It is one thing to hear speech on an 8-bit game for the first time, but great swathes of speech were found on the Amiga. Throw in support from all the major software players of the day – EA, Ocean, US Gold, Elite, Gremlin, Domark, Activision (OK maybe scrub that last one) – the computer went from strength to strength, despite it costing well over £100 more than the ST. It seemed people were quite happy to pay that bit extra back in the day. That’s not to say the Amiga was perfect. Games used to come on anything up to 10 floppy discs, which meant you needed a second, external, floppy drive to cut down on disc swapping. Those infernal password protect systems, designed to cut down on piracy, had you scanning through the manuals or playing around with the included wagon wheels so you could get the correct code to actually get into the damn game. All very commendable but it didn’t stop games being swapped rapidly in playgrounds around the country. There was also a sense with some games that they looked great but played crap, substituting the audio and visual aspect for actual playability. 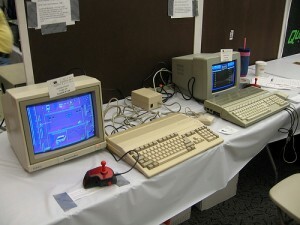 It was also the case that the Amiga suffered from lazy porting of games from the ST, meaning some inferior conversions not making use of the extra technology available. Oh and I forgot to mention that the basic model was 512K and as the Amiga grew more popular the need to have at least 1MB of memory got bigger, so much so you had to fork out an extra £30 to buy the memory needed. Oh yes, and it needed a TV modulator to play games on your TV set, otherwise you’d need to fork out a couple of hundred quid for a decent monitor. Yes, 16 bit games may have been the way to go but the move did require a hefty cash investment from gamers – as ever! Advertising has absolutely no affect on me at all. Ever. 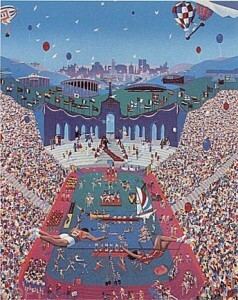 The Amiga seemed to go from strength to strength. 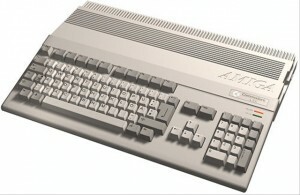 While the Atari ST 520 was upgraded to 1040 to show off more powerful capabilities, Commodore decided to add to the Amiga range. You could have an Amiga 500 in 512K or 1MB version, the Amiga 500+ (a disaster as a lot of old software wouldn’t work on it), the Amiga 600 (slightly better, with more backward compatibility) and the Amiga 1200 (with designated software titles that you could only play on a 1200 and the capability to install a hard drive meaning you could store data on it, making it more like a PC). It is an era I remember fondly, with the dross games far being outweighed by the glorious games that memories are made of. So during the course of this month I shall look back at a few games, some good, some not so good, and hope that you will revel in them as much as I do. Print article This entry was posted by RetroBear on April 20, 2012 at 6:00 pm, and is filed under Retro Reviews. Follow any responses to this post through RSS 2.0. Both comments and pings are currently closed.